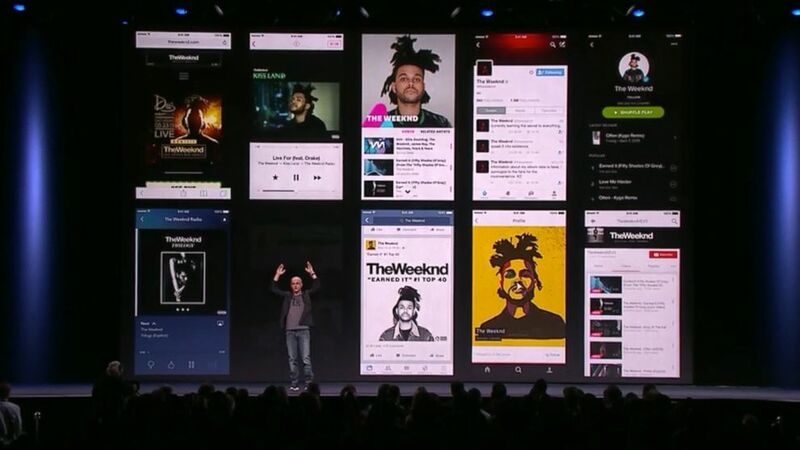 Annual Worldwide Developers Conference kicks off with Apple Music, iOS 9 news. Apple's Worldwide Developer's Conference, a major event for technologists and Apple fanatics looking to the next big thing, kicked off today in San Francisco with a bonanza of announcements. From Apple Music to the latest OS X update named "El Capitan," a smarter Siri and the death of Passbook in favor of the newly minted "Wallet," here's a round-up of everything you need to know from the keynote. Apple is launching a new subscription-based music ecosystem that includes a global 24/7 radio station called Beats 1, expert curation and a platform for up-and-coming artists to share their songs with the 1 billion strong and counting audience around the world. Beats co-founder Jimmy Iovine emphasized the carefully tailored playlists won't be grouped by genre or beats -- and instead will be curated by a team of music experts. The mandate, according to DJ Zane Lowe, is to "move the needle," pushing incredible music that may not otherwise get as much airtime on traditional radio, at the forefront for Beats 1 listeners. Also included is a "Connect" feature letting artists communicate with their fans in a more intimate way, showing daily moments or what they're working on in the studio. Starting on June 30, music fans can get a 3-month free membership, after which a $9.99/month subscription fee will apply. There will also be a family plan providing service for up to six family members available for $14.99 per month. 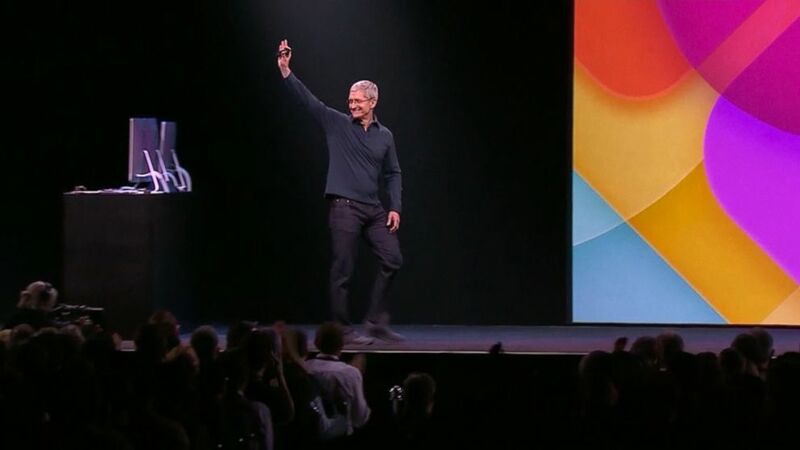 (Apple) Apple Worldwide Developers Conference in San Francisco, June 8, 2015. The latest version of Apple's Mac operating system, OS X El Capitan, has a special focus on enhancing performance for power users. Among the new features are the ability to work across tabs in Mail, pin most visited websites in Safari and work simultaneously in windows positioned side by side. El Capitan is available to developers today with a public beta launching in July. A full, free upgrade will roll out to users this fall. Intelligence is the driving force in iOS 9, which will include an even smarter Siri capable of picking up context throughout your day. "Siri has quietly become incredibly popular," Craig Federighi, Apple's senior vice president of software, told the crowd, adding that the personal assistant fields more than 1 billion requests per week. In iOS 9, Siri will be able to pull up results for requests such as "Show me photos from Utah last August" and "Remind me to grab my coffee off the roof of my car when I get in." Siri will also know to pull up music when headphones are plugged in or start an audio book a user has been listening to when they're in their car, among a slew of other context-based features. 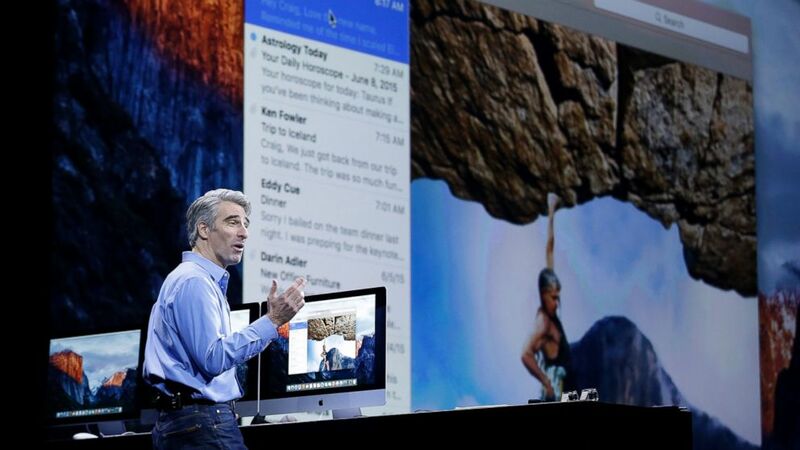 (Jeff Chiu/AP Photo) Craig Federighi, Apple senior vice president of Software Engineering, talks about the El Capitan operating system at the Apple Worldwide Developers Conference in San Francisco, June 8, 2015. HealthKit, which launched with iOS 8, will include new tracking capabilities for reproductive health, hydration and sun exposure. When a user performs a search, iOS 9 can find content behind the apps on a device and when a user taps, they're deep linked into the app to make for a seamless user experience. "We don't mine your email, your photos, contacts in the cloud to learn things about you," Federighi said of the even smarter new operating system. "We honestly just don't want to know." The added intelligence is done only on the device level and stays within the user's control, he said. Any requests that require a search, such as traffic conditions, won't be tied to a user's Apple ID. While iOS required as much as 4.6 GB of storage to conduct an over-the-air upgrade, creating headaches for some users, Federighi said iOS 9 will need only 1.3 GB. "We think everyone is going to be getting to iOS 9," he said. Apple is killing its Passbook in favor of a new feature called Wallet, which will hold store credit and loyalty cards from Apple Pay participants, along with the usual features including concert and airline tickets. Apple is seeking to get small businesses on board with Apple Pay using readers made by Square. The plastic card killer will have one million locations accepting Apple Pay next month, according to Apple Vice President Jennifer Bailey. Big city Apple users, rejoice! Apple's Maps update will include a transit feature, emphasizing public transit lines and step-by-step directions. (Apple) Apple's Worldwide Developers Conference at Moscone Center in San Francisco. Apple's News feature will include gorgeous multi-media experiences curating into a feed, based on the outlets and topics a reader enjoys. Custom layouts, imagery and typography bring stories to life from outlets ranging from small town newspapers to some of the world's largest media sources. Apple is bringing multi-tasking to the iPad with iOS 9, including the ability to work in two screens at once of even watch a video with "picture in picture" mode. Recognizing that some people use iPads as computers, quick type iOS 9 shortcuts will also be added. Six weeks after the Apple Watch reached consumers, Apple is bringing an updated watchOS to developers, allowing them to bring native apps to the wearable device. Apple's Swift programming language is going open source, giving developers a single language for creating apps for OS X and iOS. "There is seemingly no limit to what you can do and of course underpinning this, the app store is very key. It's hard to believe the app store was launched only seven years ago," Apple CEO Tim Cook said. He had one more thing to celebrate: Cook said Apple's app store recently passed a huge milestone with 100 billion app downloads. ABC News' Rebecca Jarvis contributed to this report.